Creator Spirit is on the move—to connect, vivify, and potentiate life-giving energy everywhere, like a "big bang" in the soul of God. Schrapnel spills out all over the cosmos. You expected cozy-comfy? Connections happen between and among very different things and people—suburb and city, black and white, artist and engineer, executive and street beggar, religion and science, politics and politicians, east and west, enemy and enemy, on and on. By such connections we are transformed; category-driven assumptions fall away; and something new happens. The first is traditional with a twist. 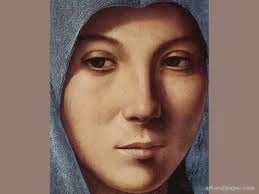 It is identified as Mary of Nazareth after she has received a strange proposal from a large male angel named Gabriel. What I love about this image is that it is honest. This image is semitic; no cosmetics take away her history and lineage. The image also goes beyond literal history to show a woman alone “pondering these things in her heart,” as the biblical story says. Mary’s “Yes” to the invitation to enter the divine life in a particular womanly way was not a quick, codependent, aiming-to-please assent. The second is a photo taken by professional photographer, David Pacheco, from inside St. Mary the Virgin Church in New York City. The church is on 46th street just off Broadway—a community with a big heart, deeply embedded in the heart of the big city. Its doors are always open for people to come into the dark quiet beauty of the sanctuary. Pacheco entitled his photo, “Stained-Glass Forty-Sixth Street.” He took it through an ecclesiastical window with small leaded panes. It seems as if the colors you see on the city street come from the stained glass in the window, but the window is clear. The colors reflect instead onto the clear window from the lights and signs on the street. It is a perfect image of the church that belongs to the city and the city to the church. It reminds me of the Latin phrase, Urbi et Orbi, which denotes the papal address and apostolic blessing, developed in the 13th century by Pope Gregory X, given at Christmas and Easter to the city (urbi) of Rome and the entire world (orbi). The third image is also city-bound but on-the-fly, this time in Boston. 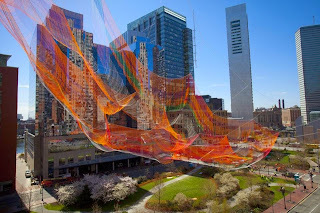 It is an aerial sculpture made of the finest high-tech rope, created by artist Janet Echelman, designed by engineers, and financed by the Rose Kennedy Greenway Conservancy, a non-profit organization currently committed to using art to lure visitors to the park. And this is a huge piece of art, weighing 2000 pounds. It’s a net, just like fishermen use. Jesus uses the image to describe his hopes for the catch the Spirit will make to populate the reign of God. Echelman went to India to paint. Her paints and brushes never arrived, so she spent time with the fisherfolk and learned how to make knots and nets. 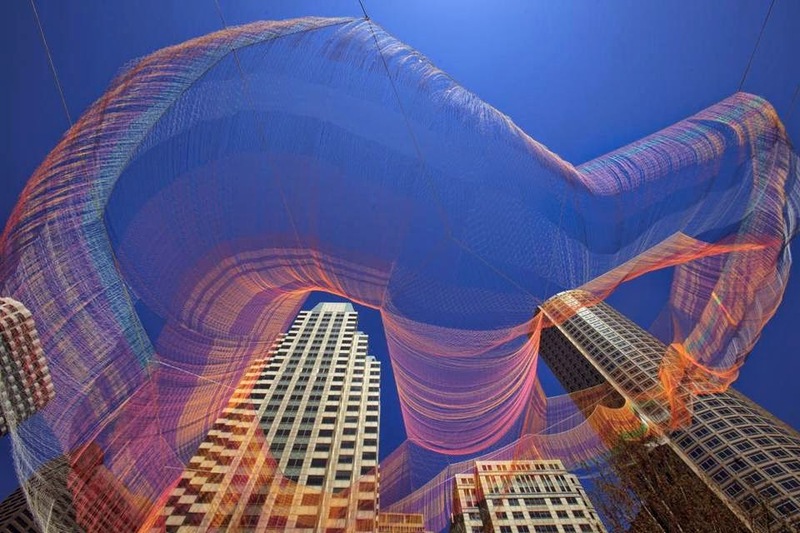 This net is gossamer, composed of many colors, fastened to the top of city scrapers. 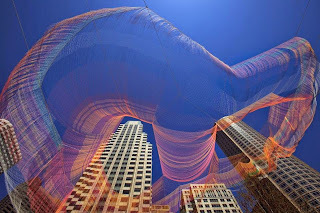 It's kinetic, shaped by changing patterns of wind and light; it waves over the Greenway, till October anyway. At night it is illuminated; all the lights in area office buildings are, by agreement, turned off to enhance the illumination. Urbi et Orbi again. The artist has not yet named the piece but has described it as “monumental softness” and “it’s about imagination.” Like any art, it depends on viewers’ projections. I can’t wait to see it in person. For me, it evokes the divine connective spirit—a true glimmer. "To sum up: ecological theology proposes that the Creator Spirit dwells at the heart of the natural world, graciously energizing its evolution from within, compassionately holding all creatures in their finitude and death, and drawing the world forward toward an unimaginable future. Throughout the vast sweep of cosmic and biological evolution, the Spirit embraces the material root of life and its endless new potential, empowering the cosmic process from within. The universe, in turn, is self-organizing and self-transcending, energized from the spiraling galaxies to the double helix of the DNA molecule by the dance of divine vivifying power." My left brain can not understand this, but my soul instantly did nip-ups when I read it. Can't explain.